Background: Cancer is the second leading cause of death globally and accounted for 8.8 million deaths annually in humans. Lung, prostate, colorectal, stomach and liver cancer are the most common types of cancer in men, while breast, colorectal, lung, cervix and stomach cancer are the most common among women. Numerous drugs that the US Food and Drug Administration (FDA) have approved for use in cancer therapy are derived from plants, including taxanes such as paclitaxel and vinca alkaloids such as vincristine and vinblastine. Still, there is an intense need for a search for numerous bioactive sources to develop a novel anti-cancer drug to overcome this chronic disorder. About more than thirty plants derived natural products have been isolated till date and are currently under clinical trials. 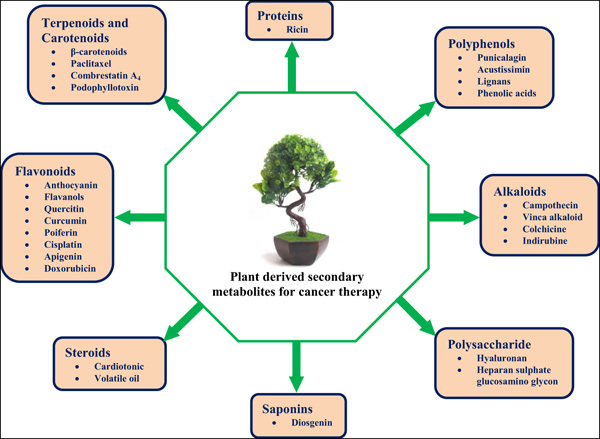 As per literature survey from various journals and texts has been found to be novel medicinal agents from bioactive sources are clinically active against various types of cancer cells. Anti-cancer, herbal, natural product, chemotherapy, plant, review.